We spend three quarters of an hour dwelling on our regrets every week, a study has found. The most common cause for remorse is not having saved more money, followed by a wish that we had put more effort in at school. Electric Zebra, in case you’re unfamiliar, are a company who produce an electronic substitute cigarette. 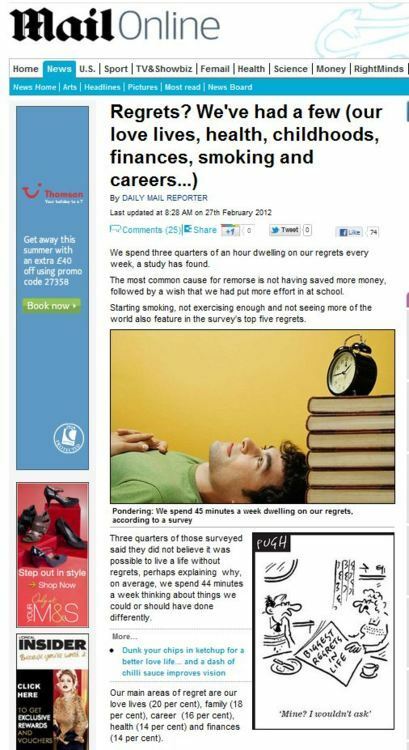 So that they found that the people they surveyed regretted smoking, is surely no surprise. This entry was posted in Uncategorized and tagged daily mail, electric zebra, survey on March 9, 2012 by Michael Marshall. Last week was a Leap Day. I don’t usually feel the need to preface posts with a calendric context, but it seems somehow crucial this time, given that a Leap Day is a day in which an archaic tradition dictates women are allowed to do that most shocking and inappropriate thing of proposing to a man – a practice which is violently banned throughout the rest of the year, punishable by death under a law which stretches back to the time Catherine the Great attempted to wed a horse, merely so as to make their first time together really meaningful, or something. OK, the latter half of that last sentence was entirely untrue, but you’d be hard pushed to believe that the notion of a woman proposing to her beau wasn’t highly illegal at every other point in the year had you so much as existed in the UK last week, given the way in which various and numerous facets of the media were falling over themselves (and each other) to talk-up the ‘magical lady proposal’ day. It’s as if radio stations, inane TV mid-morning magazine shows, tabloids and glossy magazines were somehow clutching at any straw suitably palatably fluffy to pad out their content. Funny that. We had The Sun, following five ‘wannabe brides’ as they did the unthinkable, the Scottish Sun reporting on three Scottish women who popped the question, the Mirror ambushing men conviently-closely to a prominently-mentioned bridal boutique, the Daily Mail bizarrely flogging an iPhone app, and many more. Single girls would leap at proposing …but they would still expect to be bought an engagement ring! In an ordinary year, they might be happy to wait for the man to do the asking. But almost half of unmarried women would take advantage of a leap year to propose to their partner on February 29 – though two thirds would still expect their partner to buy them a ring, a study has found. 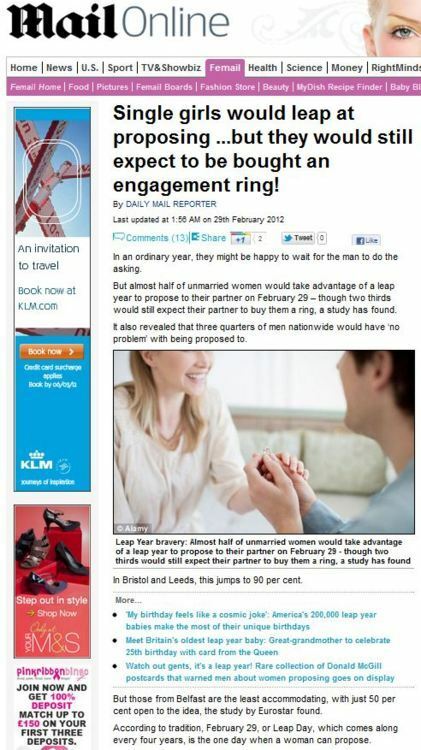 It also revealed that three quarters of men nationwide would have ‘no problem’ with being proposed to. In Bristol and Leeds, this jumps to 90 per cent. But those from Belfast are the least accommodating, with just 50 per cent open to the idea, the study by Eurostar found. Rather amusingly, the press release which formed the basis (if not verbatim, this time) of the Daily Mail story led with the clunky title “Voulez-vous vous marier avec moi?…. but only if you’ll buy the ring!” – a continental affair unsurprisingly rejected by the Daily Mail. When it comes to ideal locations, a third of those questioned for the Eurostar study said they thought Paris was the most romantic city in Europe, followed by Venice and Rome. Mary Walsh, from Eurostar, said: ‘It seems modern men have met their match in the modern woman, with thousands of ladies planning to get down on one knee this leap year. ‘Every year we see a jump in bookings to Paris for Valentines Day but this year we’ve also seen a surge on February 29, compared to a typical Wednesday. This entry was posted in Uncategorized and tagged daily mail, eurostar, Mary Walsh, men vs women, Opinion Matters on March 7, 2012 by Michael Marshall. If you want to make a headline – and, if you work in PR, that’s exactly what you’re interested in – here’s a neat little trick you can exploit: take a figure that’s relatively standard, and multiply it up by a large number – what you’re left with will seem impressive. The British eat their way through billions of apples each year, and it’s the nation’s love affair with the fruit that has made it so popular today. A billion apples sounds like an awful lot, but with a UK population of around 60 million, that’s around 17 apples each, per year. Not so impressive, then. While the BBC weren’t basing their story around the fact, it was included to give an impression that we’re all apple fiends, which the numbers perhaps don’t back up. No matter their size or shape, most women dread shopping for bras. 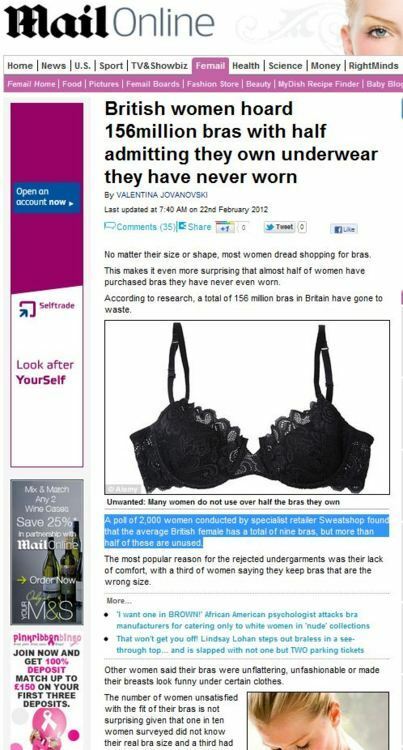 This makes it even more surprising that almost half of women have purchased bras they have never even worn. According to research, a total of 156 million bras in Britain have gone to waste. A poll of 2,000 women conducted by specialist retailer Sweatshop found that the average British female has a total of nine bras, but more than half of these are unused. For one thing, the poll was conducted by a bra manufacturer looking to get into the news, via a polling company who can be reliably shown to be questionable around the data. Furthermore, taking the results from a sample of 2,000 respondents and factoring up to an entire nation’s population is problematic, especially if the respondents can all be shown to be answering polling questions reliably. Still, the headlines sounds fun and impressive, and it means as an editor you get not only the initial story, but you can spin it into a second piece around women’s relationships with their bra, so why bother questioning the data? This entry was posted in Uncategorized and tagged Amanda Brasher, AMANDA PLATELL, daily mail, onepoll, Stats abuse, Sweatshop, VALENTINA JOVANOVSKI on March 6, 2012 by Michael Marshall. They’ve been keeping children happy for years and are a godsend for many parents when trying to keep their little ones quiet. But it would seem it is not just youngsters who appreciate the soothing benefits of the teddy bear – it still occupies a special place in the hearts of many grown-ups too. Research has revealed that 35 per cent of adults in Britain have admitted they still sleep with a teddy bear to help them de-stress and sleep at night. A total of 6,000 Britons were surveyed by hotel chain Travelodge to learn more about the country’s fascination with the teddy bear. 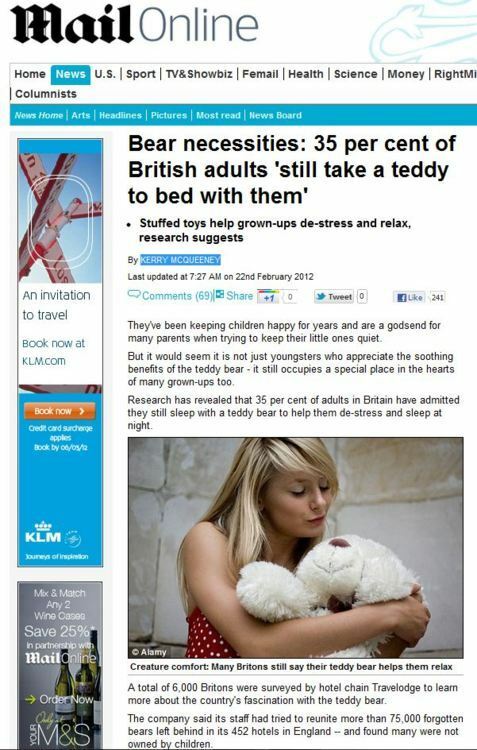 The whole story came from a press release from Travelodge, who commissioned the research partly to learn more about our fascination with teddy bears, but more specifically to get their name into the newspapers. This entry was posted in Travelodge and tagged daily mail, huffington post, Kerry Mcqueeny, travelodge on March 4, 2012 by Michael Marshall. 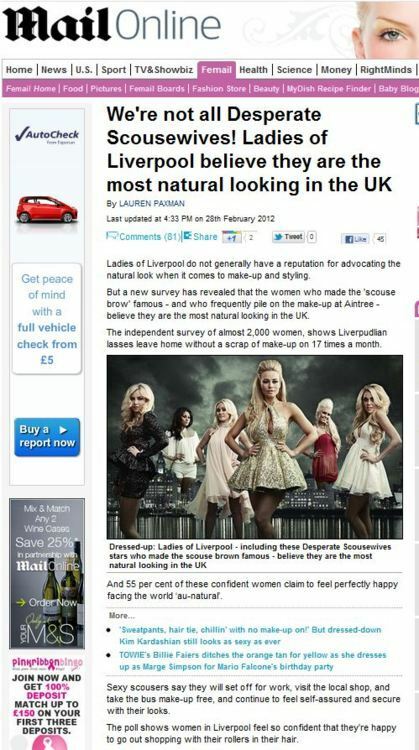 said the Daily Mail last week… erm, twice, in fact. 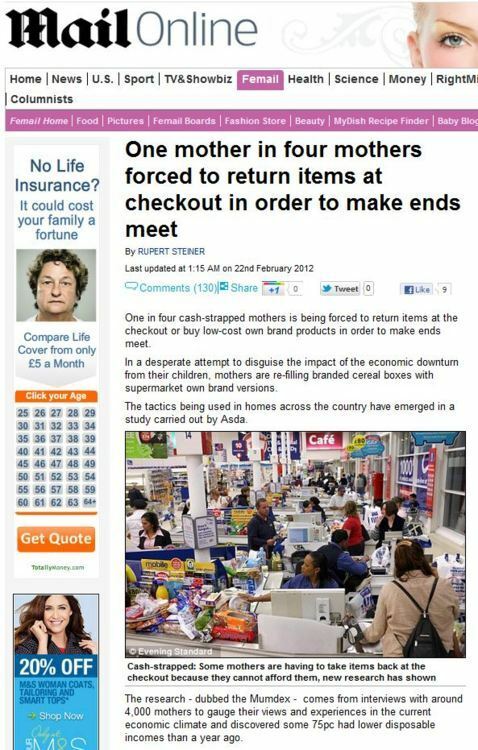 One in four cash-strapped mothers is being forced to return items at the checkout or buy low-cost own brand products in order to make ends meet. In a desperate attempt to disguise the impact of the economic downturn from their children, mothers are re-filling branded cereal boxes with supermarket own brand versions. The story also had a brief showing in The Telegraph too, as Christina Odone shared her thoughts on the findings. The tactics being used in homes across the country have emerged in a study carried out by Asda. Supermarket chains says some people are trying to cut costs, and that they’re the best supermarket to shop in if you want to cut costs. 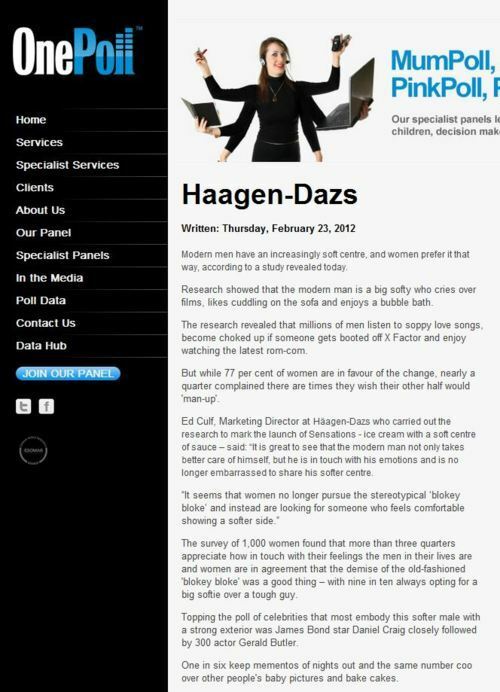 A bread and butter Bad PR story. This entry was posted in Uncategorized and tagged asda, daily mail, Rupert Steiner, telegraph on March 2, 2012 by Michael Marshall. 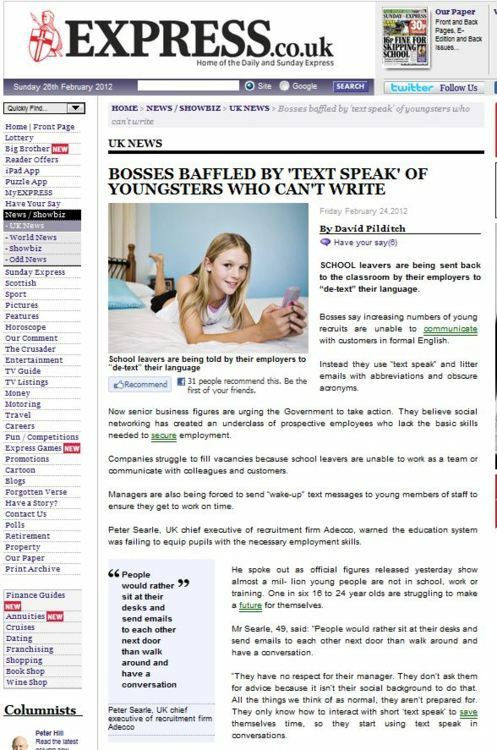 SCHOOL leavers are being sent back to the classroom by their employers to “de-text” their language. Bosses say increasing numbers of young recruits are unable to communicate with customers in formal English. Instead they use “text speak” and litter emails with abbreviations and obscure acronyms. Now senior business figures are urging the Government to take action. They believe social networking has created an underclass of prospective employees who lack the basic skills needed to secure employment. So, kids today are inequipped to function in the world of work, and it’s social media and text messaging that’s to blame? Why not throw in alcopops and rap music while you’re at it, and go the whole stereotypical hog. The photo accompanying this damning indictment of the employability of our nation’s youngsters is clearly of a girl who is around 14. That a 14 year old isn’t in any state to be employed is not only unsurprising, but legally mandated. The Daily Mail did exactly the same with their stock photo, backing it up with a photo of what appears to be an adult woman texting badly about meeting at school. Bizarre. The Express, in a story decrying the inability of youngsters to use a high standard of language, ran with this URL: http://www.express.co.uk/posts/view/304031/Bosses-baffled-by-text-speak-og-youngsters-who-can-t-write. Oh the irony. Youngsters only know how to interact that way, or is it that they also know how to interact that way? An interesting claim – and one we’re given absolutely no proof for. We have instances in offices where people would rather sit at their desk and send e-mails to each other next door than walk around and have a conversation. Instances? Are we to believe this is a behaviour so entrenched in the nation’s youth that it deserves to have them written off in headlines in the papers, or are these merely ‘instances’? Research for Adecco found that 52 per cent of employers believe the British school system is failing to equip youngsters for the world of work. Adecco – the recruitment firm – tell us that people leaving school are unemployable because of all those things that youngsters today do that the generation or two above them didn’t do. This is just another example of the generational decline narrative, which we’ve seen before on this site – decrying the youth of today is a handy storyline that reliably makes headlines. One fifth (18 per cent) of UK employers believe school leavers make better employees than university graduates, according to new research from Adecco Group UK & Ireland, the UK’s largest recruiter. This entry was posted in Uncategorized and tagged Adecco, daily express, daily mail, David Pilditch, Laura Clark, Peter Searle, Recruitment PR, the kids aren't alright on March 1, 2012 by Michael Marshall.